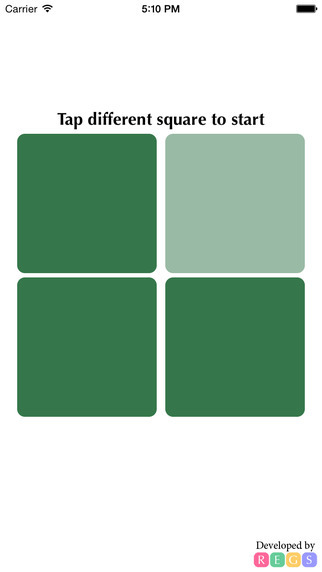 Number Painting is a free puzzle app game that's been done many times before. It's a topology game, which I like. The object is to start at 1 and swipe through all the numbers and all the tiles and end on the largest number. The graphics are fine. An unfortunate thing is that you cannot go ahead or go back! I did the first 150 levels in about 90 minutes. Keep in mind, I've done thousands of these before. (Sadly, that's not an exaggeration.) I've spent over an hour on it. What's particularly interesting: Level 147 is the first level that doesn't use any numbers - just question marks. They are all interchangeable - meaning any of them can be 1 or 2. In level 156, half the markers are are numbers and the other half are question marks. Interesting variation. Another interesting feature are the X boxes which cannot be traveled on. Some levels - I see the answer instantly. Others take a little trial and error and can take 20 minutes.. Many of the puzzles have multiple solutions, but not all. Level 301 is the first level where arrows are used. Land on an arrow and you must go onto the next square indicated. Level 319 was annoying! I won't tell you why. But if you get stuck on it, I can send you a hint. Check out Numberic Paranoia and Space Dots which are both similar. Update 11/4/14: I'm still stuck on level 338. I contacted the developers and they assured me that it was solvable. I'm # 1 on Apple's Game Center Leaderboard. However, somebody on the Android platform has gotten to 414. I promised to post another negative blurb about a terrible puzzle app. Points Catch the Balls is beyond bad. Yes, you must rotate your polygon to catch the ball with the correct side. However, ads pop up on the screen, while the game is in play. The ads take up the middle of the screen. Besides this concept not being original, the implementation makes me want to never even try another app from this developer. Tomorrow I'll post about a good app! Monday I posted a negative thing about a pretty good puzzle app. Tuesday I posted my disappointment at a terrific puzzle app that seemed to be a complete copy of another puzzle app. So today, let me complain about Quench. It's another version of Lights Out. The world does not need another version of Lights Out. We don't need another version of Rush Hour or 2048 either. Or Sudoku. Or the 15 puzzle. Puzzle App Developers/Publishers: if you can't come up with something original, do not publish your game. It's clogging up the App Store and people can't find the genuine good stuff. Tomorrow I'll complain about something else. But I promise to be more positive on Friday and all of next week. The object of Very Bad Cube is to slide colored cubies left/right and never up/down until same-colored cubes stick together. The puzzles themselves are terrific: fun, challenging and usually provide an 'Aha' moment. We've seen this concept before with Jelly Blocks and Denki Blocks. Both of those are outstanding. Some fans of this blog have noticed that I focus on the positive too much. So now for the negative about this puzzle app. Many of the puzzle levels in Very Bad Cube are IDENTICAL to the levels in Jelly Box Puzzle Lite. It might be that all of the levels are identical to the premium version of Jelly Box. Jelly Box Puzzle Lite came out October 1, 2014 while Very Bad Cube came out September 13, 2014. The author of Very Bad Cube contacted me and asked me to do a review. I later contacted him and asked him about the plagiarism/theft. Who stole from whom? Or did they both steal from somebody else? No response. I also contacted the author of Jelly Box - also no response. What is the ethical thing to do if you want to play these? My opinion: download Very Bad Cube and turn off the wifi so you won't get the annoying ads. Tomorrow I'll post something negative about another puzzle app. I'm on a roll. The object is to capture the yellow circles with the moving yellow dot. When you tap, different things happen, depending on the level. On some levels, the triangles rotate. On other levels, the blue triangles will turn on/off. The yellow dot will pass through the off triangles. See the spirals? Those are wormholes. Ichi has 72 levels. I've solved the first 20 or so. There's one thing I don't like about Ichi: on some levels, you must draw a temporary wall. The mechanism for this is annoying. So that's it, I'm abandoning it. However, the levels I did do - I thought they were well designed and fun. Interestingly, Ichi allows you to make your own levels. So if the 72 provided levels are not enough, you can do some 33,690 other levels produced by other players. Of course, you can make your own levels. About the graphics: I like the simplistic graph paper look. However, I wish things were a bit bigger/darker & more pronounced. A few days ago Ichi was listed for free for a limited time. It's now back at $1.99. 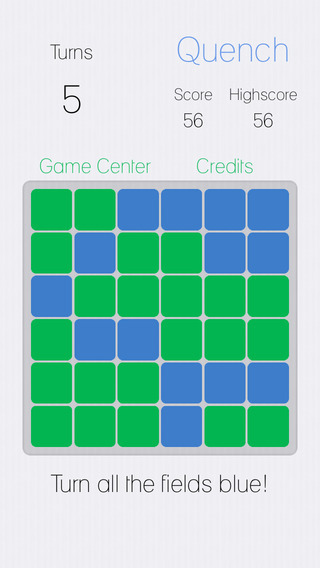 Tap the Square is a visual speed game. Just tap the square that's a different shade. You can see that the first image is simple but the next one is very difficult to spot. My ipad has one of those plastic cover shields, so I'd like to think that it makes it more difficult. When I can't spot the different square, I quickly tap every square! We should all be playing speed/reflex games to ward off Alzheimer's. Besides, they're fun. Next week I'll be reporting on another one of these that is very different and can actually be played by multiple people at the same time - provided you have an ipad. you may have noticed that I've slowed down a bit in my reviews of new puzzle app games for the iphone, ipad. The simple reason is that I've been completely addicted to Threes! I gave myself a goal: to get a tile of 3072. I achieved the smaller tile 1536 about 10 times. When I look at the Leaderboard, it seems like everyday people are scoring the 3072 tile - and beyond. Who are these people? Do they have the same genetics as us mortals? Last night I got my final 1536 tile - with plenty of extra room. I then played it slowly and carefully. I even took a break. Unfortunately I did not get good + tiles, the tiles that are not 1, 2 or 3. The only way to cure this addiction is to delete it. Already I feel better. Lines War is a puzzle app game that we've seen before. But not recently. The object is to quickly draw lines to seal off the grid from the bouncing ball. Once you wall off 75%, you're done! 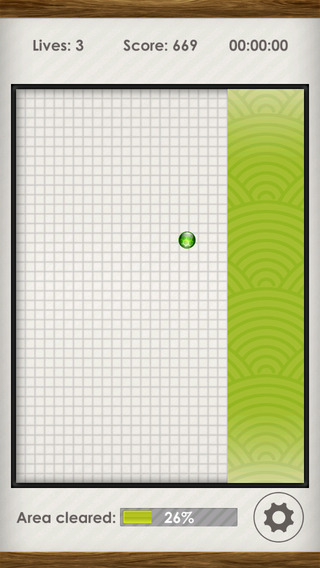 Level 2 has two bouncing balls - much tougher. I don't have the patience for that. But it's fun! Dylan from Big Round Eyes recently contacted me about a puzzle app game of his called Nexionode. Your task is to turn the orange lights blue by making contact with another node. Essentially, it's a topology game. Knowing where to start and where to end is key. At the beginning, all the circles have orange lights. You must change them to blue by connecting them to another circle. At first, I thought to myself: just another topology game. However, These can be really challenging. For one thing, there are gray squares that act as obstacles. Later on, the tiles are in perpetual motion and everything must be connected before intersections take place. For those levels 3 things must happen: first solve the puzzle in the normal way (only in your head), strategize how to do, then do it lightning quick. Behind the puzzles, there is a science fiction story, but I didn't pay attention to it. If you've been following this blog, you know that I always turn off the music & sound effects - to preserve the battery. I just noticed the review you wrote for Nexionode on your blog, thank you. Thank you for taking the time to test and write about the game, I really appreciate it! I’m glad to hear that you enjoyed it and find it challenging. Also, I’d like to mention that there are two versions of the game, Nexionode and Nexionode Lite: The full game Nexionode is available for $2.99 and there is a free demo Lite version with limited levels for those who want to try it out (neither version has any in-app purchases or advertising). I was wondering if it would be possible for you to mention this in your article? Thank you again and I wish you continued success with your blog. Alan Kong has come up with an interesting test-your-reflexes game. As the colored balls fall from the top, you must rotate your polygon by tapping and catch the red balls with the red side etc. It's a good game. But the speed picks up too quickly for me. In any case, it's another good game/exercise to ward off Alzheimer's. In 2002, I hosted the first New York Puzzle Party. One of the attendees was Robin King. I had actually met Robin a year or two before, very briefly, at the New York Toy Fair. The company that produces the card game SET, had a competition. Using their computer, how many sets could you find in 1 minute. I was in the lead. They told me to come back at 3:00 to claim my prize. So I did. I think I won a brand new deck of SET. 5 minutes later, Robin shows up and beats my record. But it was after 3:00. I saw her name on the badge and was very impressed with the company she worked for: Games Magazine. After the NYPP in 2002, Robin invited me to play test some games with her husband John McCallion. On the way there, I thought to myself: my sisters are going to be so envious because I'm entering the Games Magazine office to play test. In fact, we met at the Manhattan Fire Safety office on 32nd street. This, I learned, was John's real job. It's really one of the most boring offices I've ever seen. 20 desks with telephones. Everybody's job: to sell fire extinguishers. I never actually saw anybody except John & Robin in the office, since I would always arrive at 6:00. Over the next 10 years I would play test with John & Robin, usually on a Wednesday night. Typically, we would play 3 games for about 2 hours. All sorts of games: card games, board games, games with a thousand rules. John would always read the rules. About 90% of the time, Robin would win. During the night, John would lose his temper at me, or at Robin or another play tester because we had forgotten an obscure rule. It was always amusing to me to see him so frustrated and him cursing - in a genteel way! - with his Irish accent. I never met the man who owned/ran Manhattan Fire Safety, but I noticed that he left sarcastic memos around the office. On and off I would tell John & Robin that they should write more about mechanical puzzles. One day, Robin suggested to me that I give it a shot. My first article for Games Magazine appeared in the February 2006 issues. 6 pages called The Puzzling World of Oskar van Deventer. I was off and running and gave myself the title Mechanical Puzzle Correspondent. I wrote 27 articles. But it's all come to an end. Last year, around Thanksgiving, Robin passed away during a lung transplant. I knew she had been in the hospital for months, and felt guilty about not visiting her. Then I saw John on the 7 train. He told me that she had gotten the transplant and it was a success. According to the hospital officials. He was overjoyed. Unfortunately, it was not a success and Robin passed away several days later. My editor at Games Magazine, Wayne Schmittberger, was recently fired. The entire magazine has been downsized. It may even stop publishing. John has quit. What I've learned is that when things fall apart, they do so very rapidly. Below are some links from Drew Davidson. I play tested with John & Robin and a bunch of others. I don't think I met Drew. Perhaps I have. Robin & John always had a thank-you dinner at an Indian restaurant at the end of the year for all the play testers. Drew's 3 part story is better written and more comprehensive than mine. There are 4 levels of difficulty. The easiest uses a 4x4 grid, while the hardest uses a 7x7 grid. I've solved puzzles at each difficulty level. The puzzles seem to be randomly generated each time. Which is good and bad. Good, if you want to keep playing this game forever. Bad, if you're the type that wants a set of 50 or 100 levels and solve them all with a sense of accomplishment. I like this concept. However, there are multiple solutions, which make the expert levels not that hard. 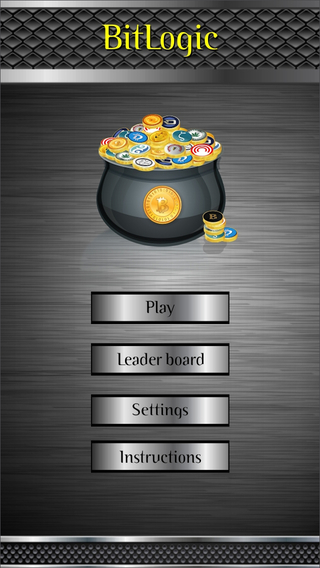 I was very curious to see a puzzle app game that involved Bit Coins. Unfortunately, BitLogic will teach you nothing at all about it. 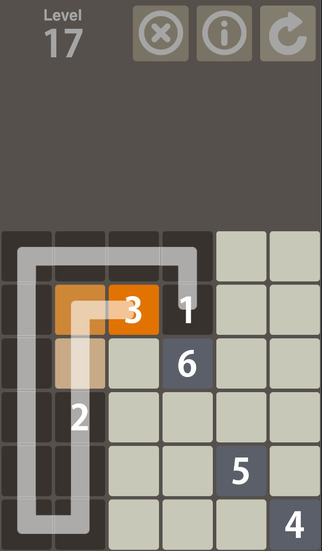 BitLogic is a clone of 2048, which is a clone of Threes!, which I've played extensively. The main problem with BitLogic is that it's impossible to memorize the sequence of merging. 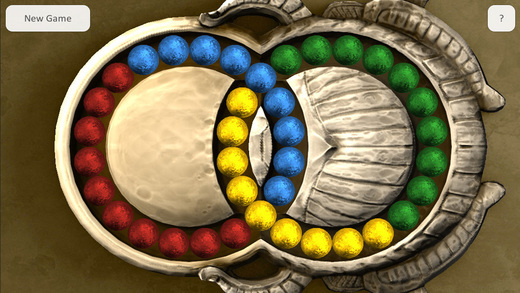 The lowest coin is the golden one and 2 of them merge into 1 of the blue ones. 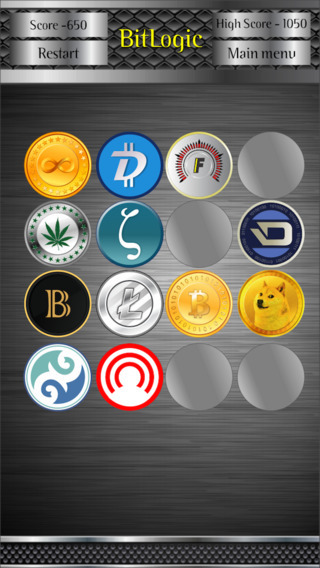 It would be handy to have that merging guide of all 12 coins on the same screen. http://www.sembrodevelopment.com/ is the home company and after watching their video of what they do, I still have no idea what they do. Must delete this immediately. Roy Hamm recently contacted me about his puzzle app game: Dozen! It's a game to test your reflexes/speed.Read the instructions of the 3 images in order to get the rules/objectives. It's another good, fun game that may help ward off Alzheimer's. We should all be playing these types of games. Dung Rings is a free puzzle app game that's pretty much the same as the Hungarian Rings - a mechanical puzzle from about 25 years ago. In 2000, Rubik came out with his own version called Rubik's Rings. The object is to scramble the pieces and then restore the pattern. Getting the outer rings is fairly easy. It's where the circles intersect that gets tough. Yasarcan Kasal has created a game to test your reflexes. 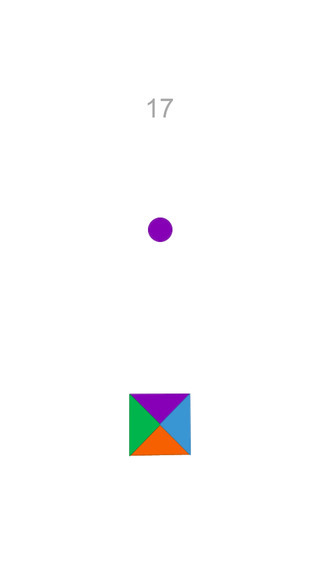 Balls drop from the top and you must tap the screen to rotate your polygon so the colors match. I like that the game starts with just 2 colors. But, too quickly, it changes to 3 and then 4 colors, which is just a bit too fast for me. This is a good game to ward off Alzheimer's. Keep your brain sharp! Galia Aviram has created a maze puzzle app game that requires you to navigate the drone soldier to the enemy's ammunition hideout. Seems kind of easy, but these are pretty tough. Doors open only 1 way. There's a lot of backtracking. See the yellow keys in the second image? Passing over 1 of them will open a specific door someplace else. There are only 25 levels and I've solved 9 of them. These are really good puzzles. However, there are too many ads and the graphics could be so much better. Also, we've seen this type of maze/door puzzle before. I'm not sure if these puzzle levels are original. But they are challenging and solving 25 is plenty. Dror Zalman recently contacted me about his game Pop The Cube. The objective is to score points and solve each level by firing colored blocks, from the gray squares at the bottom, at the colored squares that travel horizontally across the screen. 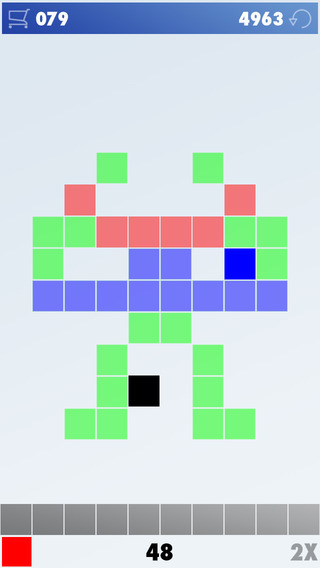 If your block missile can hit the target at the same spot as one of the fixed colored squares on the board, Pop! Once they are all popped, you can move on to the next level. I did the first 3 levels. There is some potential for this type of game. It's a bit slow. The graphics are old school. Strictly for kids. David Allan recently contacted me about his puzzle app game Light 'em Up: Only Smart Players Can Win. As you can see from the images, you must rotate the pipes in order to bring the electricity to the light bulbs. I raced through the first 20 puzzle levels in about 10 minutes then got stuck on 21. Why? Because there's a time limit and it's impossible to tap/rotate the tiles in the time allotted. I did send David an email about this, but got no response. I'm not a big fan of the pipe rotating genre. One very interesting exception is Amid Worlds. Although technically it's more of a laser puzzle.